The Chronicles of Ellie Bellie Bear: Music Therapy for language development, social skills, and for fun! 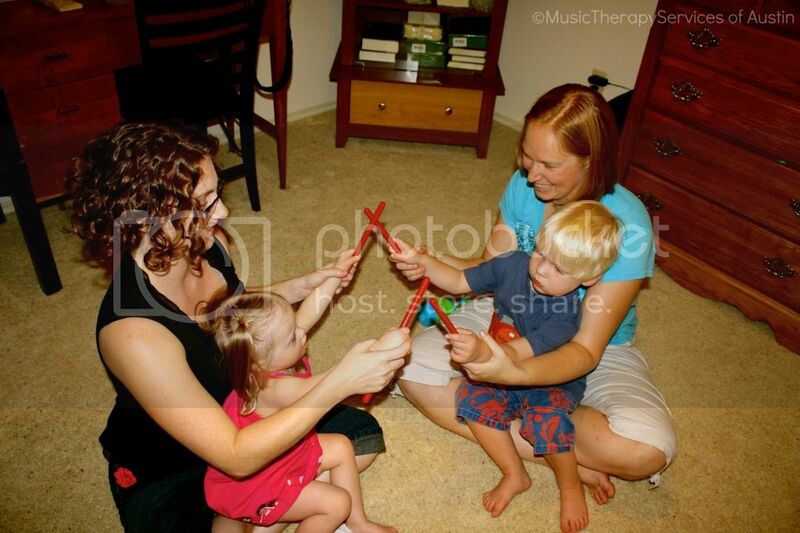 Music Therapy for language development, social skills, and for fun! Sometimes I feel as though we are greatly bogged down with therapies. We had many therapies scheduled to assist Ellie in learning to speak, in developing fine motor skills, and in coping with sensory-seeking behaviors. This summer I have cut back on therapies whether it be shortening the duration of each session or canceling a certain therapy all together. She/we needed a mini break. There is one type of therapy that we are not foregoing this summer--Music Therapy. This therapy is by far Ellie's favorite. She loves the teacher, she loves her buddy Jack, and she is progressing in communication and socialization. Plus, who doesn't love to sing songs, dance, and bang on a drum? As per Wikipedia: Music therapy is an allied health profession and one of the expressive therapies, consisting of an interpersonal process in which a trained music therapist uses music and all of its facets—physical, emotional, mental, social, aesthetic, and spiritual—to help clients to improve or maintain their health. Music therapists primarily help clients improve their health across various domains (e.g., cognitive functioning, motor skills, emotional and affective development, behavior and social skills, and quality of life) by using music experiences ...to achieve treatment goals and objectives. How can music therapy help my child? Music therapy in beneficial for those with learning disabilities, speech delays, cognitive disabilities, Autism, chronic pain, brain injuries, and physical disabilities. Music therapy can address the development of gross/fine motor skills, receptive & expressive communication, and socialization. It also helps with relaxation. 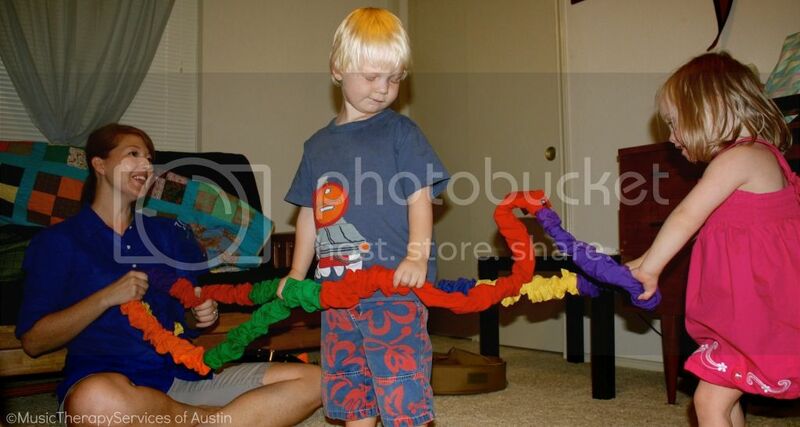 Communication and Fine Motor Skills. 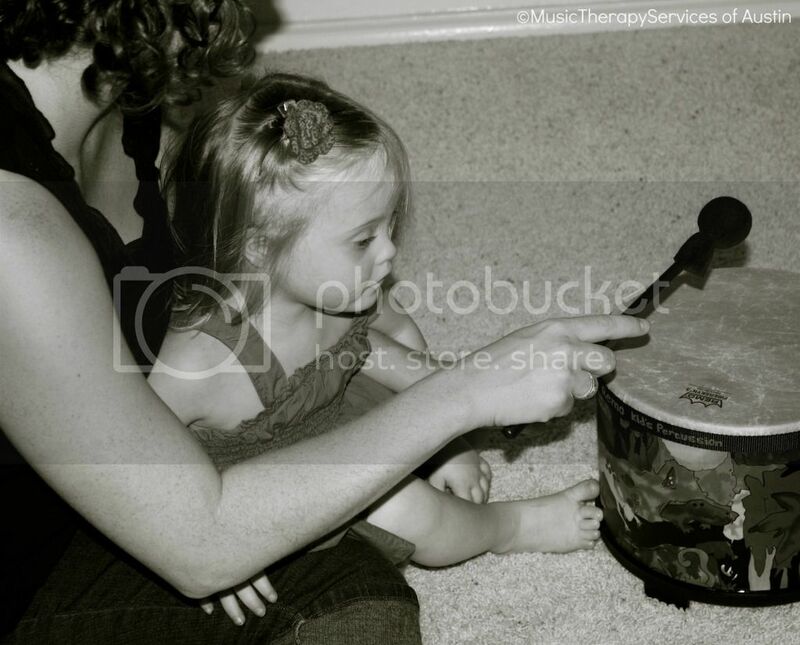 Music therapy has helped Ellie improve her signing and vocalizations. She has learned new signs in asking to use instruments. 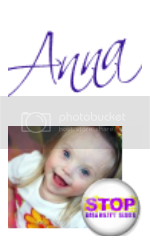 She started vocal approximations for the various colors such as blue, purple, and green. Her fine motor skills have progressed as well. The iPad is incorporated into our music therapy and it is a big motivator for Ellie. The apps used during the therapy sessions have encouraged Ellie to isolate her pointer finger for pointing and in performing some signs for communication. Ellie has learned the importance of turn-taking as well as imitation. Our therapy session is a "group therapy" session, but there can be individualized sessions as well. Ellie has her own goals separate from Jack's goals. However, having Jack in our class is a huge benefit. She has to learn to wait her turn--she is learning about raising her hand, sitting for her turn, and signing "my turn". At this point, Ellie signs "my turn" and immediately grabs the maraca or drum stick out of Jack's hands. She is a little thief! The Wheels on the Bus has helped build Ellie's motor skills as well as imitation skills. She is encouraged to imitate honking the horn or making the wipers go swish swish swish. In fact, The Bear can be heard making swish-swish sounds. Certain songs involve mimicking Miss Rachel such as shaking the maraca up high and then shaking it down low. 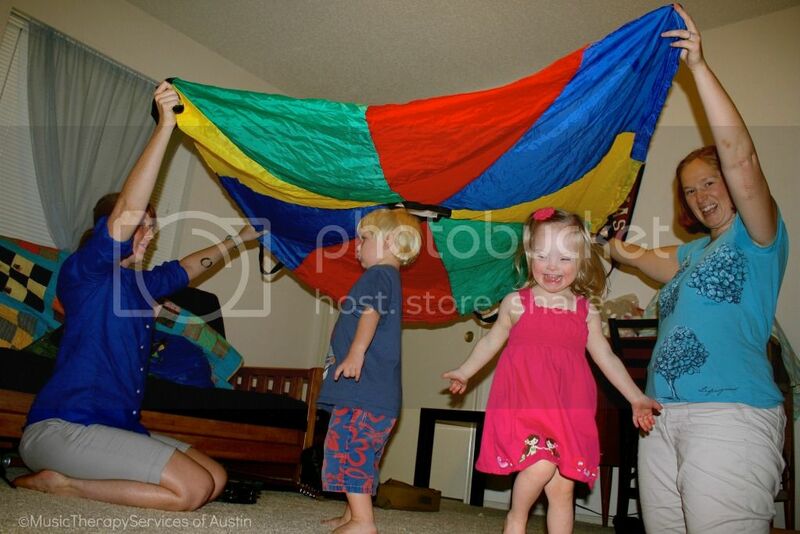 Music therapy incorporates multiple sensory-packed opportunities into each session such as banging on a drum, using the multi-colored resistance band, or sitting under a waving parachute. I have learned that I can apply music to just about every aspect of daily life with Ellie and the singing helps calm my little climbing wind-up-toy of a daughter down. I have turned good ole Row-Row-Row Your Boat into a sensory song in that I apply compressions to Ellie's shoulders and arms and then encourage her to pull-pull-pull. During times of great frustration, occasionally, singing the songs calms Ellie down. 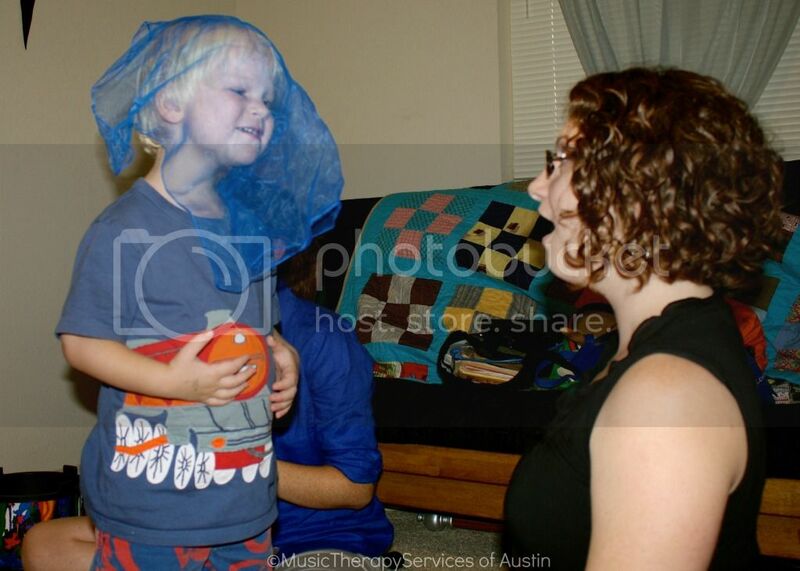 To see more of Ellie and Jack participating in music class, check out Music Therapy Services of Austin's blog post-P is for Peas in a Pod. 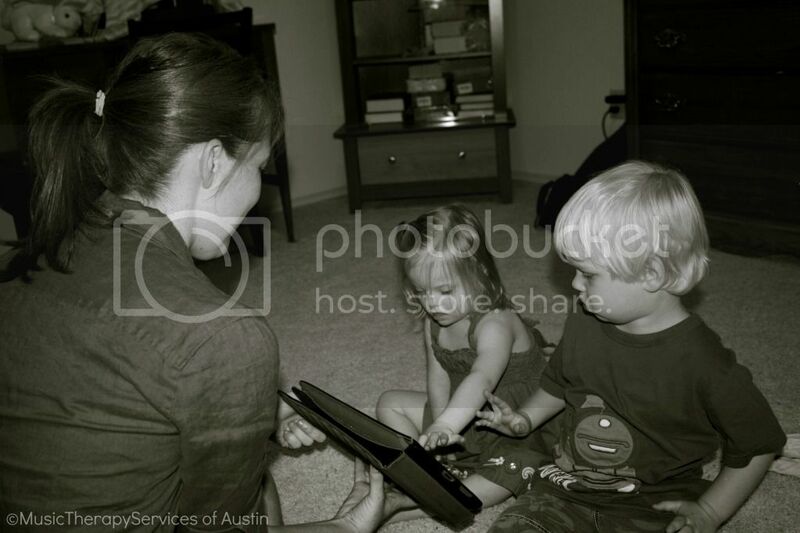 For those in the Austin area, we attend music therapy sessions through Music Therapy Services of Austin with Rachel See-Smith as our music therapist. As my regular readers of this blog know, I do not advertise for the hopes of receiving free services, I just think Miss Rachel is that good and that Ellie has greatly benefited from Music Therapy. What fun therapy! The big parachutes were some of my favorite things to do in PE during elementary school! 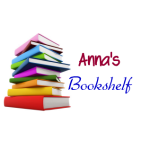 Anna, thank you so much for the kind words!! Spending time making music with Ellie and Jack is a is one of my favorite times of the week, and seeing you and Jack's mother interacting and supporting your children throughout the session has been such a beautiful thing to witness. Thank you for allowing me to work with your child. Ellie is truly a talented and special kid! 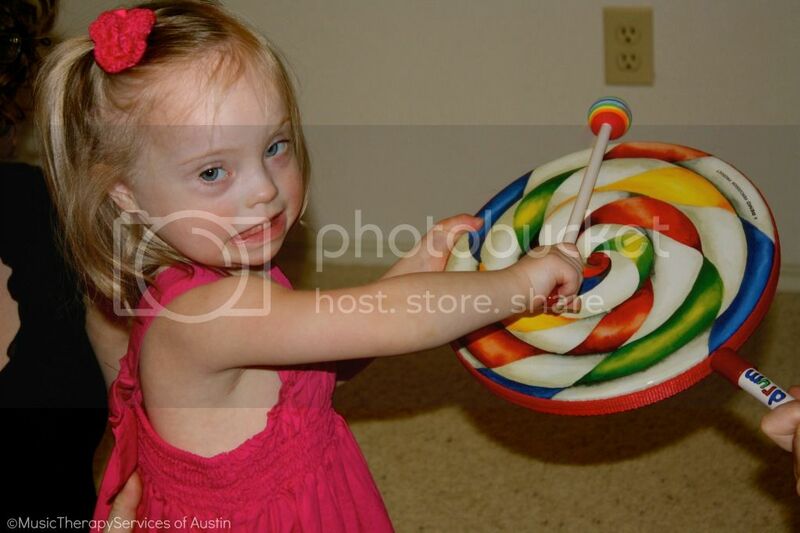 Love these pics of Ellie in therapy!!! It is obvious that she loves this therapy! I'm looking into music therapy when Hailey is a little older. Our DS group offers it once a month but I think she might enjoy it more often. Ben gets to begin weekly music therapy in the fall. I can't wait! There are many people all over the world who love to listen to hip hop music. While there are some who makes certain hip hop music, those people usually look for hip hop loops. What a wonderful post! And, while I might be a little biased as a music therapist and one of Rachel's friends, your little one sounds like she's making great strides!